Getting enough calcium and vitamin D in your diet can help maintain bone strength and lessen your risk of developing osteoporosis. Your body needs calcium to keep your bones dense and strong. Low bone density can cause your bones to become brittle and fragile. These weak bones can break more easily, even without an obvious injury. Vitamin D helps your body absorb calcium. Eat foods that provide the right amounts of calcium, vitamin D, and protein. This kind of diet will give your body the building blocks it needs to make and maintain strong bones. In addition to getting enough calcium and vitamin D, you can reduce your risk of developing osteoporosis by exercising regularly and avoiding smoking and excessive alcohol use. Amounts of calcium are given in milligrams (mg), and vitamin D is given in international units (IU). Too much calcium or vitamin D can lead to problems such as an increased risk for kidney stones. Milk and dairy products are the best sources of calcium. They contain a form of calcium that your body can absorb easily. Choose yogurts, cheeses, and buttermilk. Adults should choose fat-free (skim) milk or low-fat (2% or 1%) milk, and other lower fat dairy products. Removing some of the fat does not lower the amount of calcium in a dairy product. Yogurt, most cheeses, and buttermilk come in fat-free or low-fat versions. Vitamin D helps your body use calcium, which is why vitamin D is often added to milk. If you eat very few or no dairy products, you can find calcium in other foods. It is often added to orange juice, soy milk, tofu, ready-to-eat cereals, and breads. Check the labels on these foods for added calcium. Green leafy vegetables, such as broccoli, collards, kale, mustard greens, turnip greens, and bok choy (Chinese cabbage), are good sources of calcium. Cook high-calcium vegetables in a small amount of water for the shortest possible time. They will retain more calcium this way. 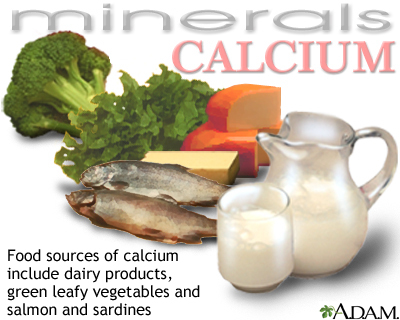 Be careful about what you eat with calcium-rich foods. Certain fibers, such as wheat bran and foods with oxalic acid (spinach and rhubarb), can prevent your body from absorbing calcium. Your doctor may recommend a calcium or vitamin D supplement for the calcium and vitamin D you need. However, the balance between benefits and harms of these supplements is unclear.